CRD Helps Guide Home Remodeling Clients Through the "Remodeling Curve"
Remodeling one’s home can be a taxing experience, and for some, there is a point in the process when elation over the new project turns to impatience—particularly when the disruption gets to be too much and signs of progress are not as noticeable. 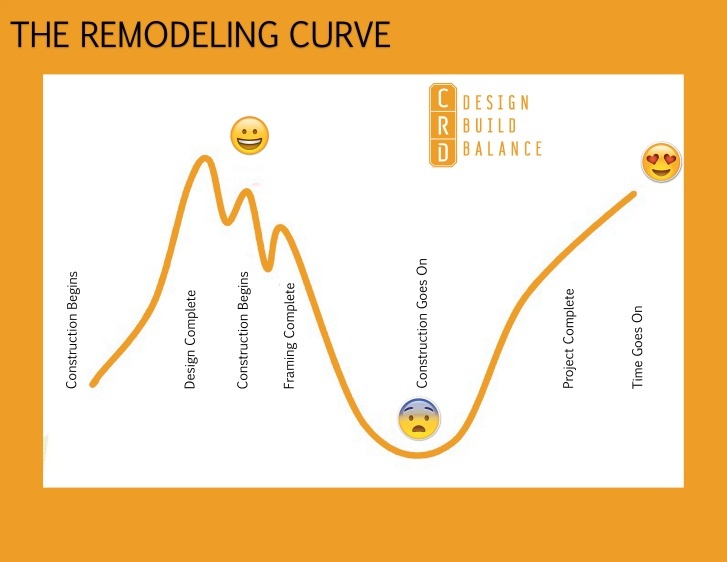 The emotional ups and downs of the construction process is called “The Remodeling Curve” and it is something that we at CRD Design Build like to address with clients up front. Even with CRD Design Build’s meticulous remodeling planning process and our efforts to go above and beyond to keep jobsites neat and tidy, remodeling projects can cause some interruption to daily life. We like to provide this friendly “Remodeling Curve” infographic to clients prior to the beginning of construction to help remind them that ups and downs are normal, and it is all part of the process.